We’d love your help. Let us know what’s wrong with this preview of The South Sea Bubble by Alison DeLuca. Lizzie and Miriam find horror, adventure, and romance surrounding the strange vessel known as The South Sea Bubble. Also available as a Kindle edition on Amazon. To ask other readers questions about The South Sea Bubble, please sign up. A quick declaration: I had the pleasure of drawing the maps for this series of books, and am thus listed (rather loftily) as ‘illustrator.’ This created an odd situation of discovering what things on my map meant as I read about them! 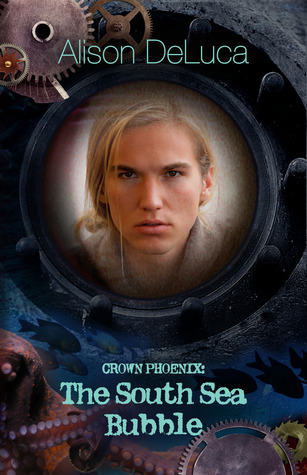 It is highly likely that anyone reading Crown Phoenix Book 4: The South Sea Bubble will have already read the first three books in this excellent quartet. The books form two ‘pairs’ with books one and two focusing on Simon, Neil and Maryam, with the latter two conce A quick declaration: I had the pleasure of drawing the maps for this series of books, and am thus listed (rather loftily) as ‘illustrator.’ This created an odd situation of discovering what things on my map meant as I read about them! It is highly likely that anyone reading Crown Phoenix Book 4: The South Sea Bubble will have already read the first three books in this excellent quartet. The books form two ‘pairs’ with books one and two focusing on Simon, Neil and Maryam, with the latter two concentrating on Neil’s sisters—Lizzie, Ninna and Matilda (and through them the Squire’s son, Toby). The setting is Edwardian, with an increasing dash of science fiction and fantasy—enough to warrant a ‘steampunk’ categorisation. Yet in a way this is a book that transcends label and genre. It is a children’s book that does not patronise; it is a science fiction book with magic; it is a love story without sentimentality. Alison creates a very believable and enjoyable range of characters, none more so than the often awkward Lizzie. Beyond others in the novel, it is her compassion for her family, her determination, and her love for Toby that brings everyone through the final devilish plot of Barbara Cantwell. And what a delicious villain Barbara is—a remarkable beauty, seemingly flawless on the exterior, yet a vile callous creature within. Alison creates a fascinating mystery set within the grounds of the mansion from the last book, now functioning as a hospital for recovering addicts. Strange visions of a submerged bathysphere enter the dreams of both Matilda and Lizzie, and ultimately provide a mystical link with Toby who resides far away on the Lamplighter’s Special. But the strange abilities that Lizzie has developed after the events of book three are not unique, and Barbara has become far more dangerous. The plot moves at a greater pace than the prior books, with a more confident style to the writing. The various solutions to the mysteries fall into place perfectly, all at the correct moments to keep the tension going. More than others in the series, the children are the true heroes in the book—unravelling the strange occurrences without need of aid from Mana. Perhaps that was why of the four books I enjoyed this one the most—it was as if the children within it had come of age, shown that with spirit and determination, and indeed love and friendship, that evil could be conquered. There is enough bizarreness and weird science to keep the steampunkers happy here, and what I found refreshing was that there was little need to info dump on the reader. Whereas most things become clear in the end, there is still a mystique remaining at the end of the book. Not all matters need explanations—some things are simply magical. There was a hint of Alan Garner, E Nesbit and Pullman in this work—and Alison DeLuca definitely matches their pedigree. So I completely recommend this as a grand finale to the series and, in my opinion, the strongest of the four. Get the lot! First, I would like to thank the author Alison DeLuca for giving me this book for an honest review. I have thoroughly enjoyed reading this series. I am looking forward to reading them to my grandchildren to share the adventures of these characters. The world building is nicely done and the story-line is good. The characters are well developed and written. I am looking forward to reading more from this author. I loved this series, however, is this really the last book?! I still have unanswered questions! recommend it to others. Their are 4 books in the series. Long story short, I love this series. The characters are engaging, the pace is well managed and there's always something new to draw you in. I highly recommend this series on multiple levels!